Dr. Faydra Shapiro – an outstanding scholar and teacher, who is also a warm and wonderful woman I am honored to call friend – invited me to review her new book on Amazon. It is an honest and brave work and a true and refreshing challenge to one’s ingrained and established dogmas. This is the kind of scholarship we need – real and open – in order to recognize and constructively deal with the many ‘bugaboos’ both Judaism and Christianity have entrenched in their thinking. Thereby we can begin to move some of the man-made fences erected for protection or in hostility and can begin, finally and happily, to sit together as brothers and sisters. Recognize the Bugaboos and Help to Move the Fences! Dr. Faydra Shapiro has placed herself in the midst of the relatively modern struggle for understanding and partnership between the historically estranged camps of Judaism and Christianity. An estrangement that is the result of valid causes; the predominant of which has been Anti-Semitism, usually politely submerged but too often openly virulent and violent. Again, unbelievably, in our post-Shoah days, this curse is exposing itself in the form of Anti-Zionism. 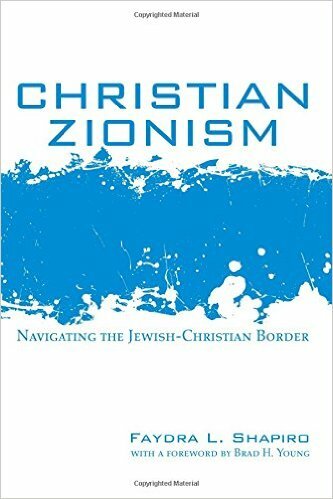 An unprecedented factor in this fray is the emergence of Christian Zionism, whose members, although largely evangelical, are found across the Christian spectrum. A common element shared is shock at the knowledge of atrocities committed against the Jewish people at the hands of Christianity (the most recent being Hitler’s attempt at genocide and Anti-Israel political hostility), together with the determination to not stand idly by as Jews again come under unjustified and disproportionate attack. Beyond politics, however, in the attempts at reconciliation something deeper is slowly emerging. The esteemed Rabbi Meister, of blessed memory, applied to the endeavour the term, “a sacred calling.” All who share a strong faith in the common ground of the Hebrew Scriptures are aware of the hand of G-d in the unfolding of history and in His plan for the redemption of mankind. It is in this vital and challenging arena, which demands interpretation of these very Scriptures, that significant problems arise to produce tensions in the complex Jewish-Christian relationship. This sacred quest for mutual understanding can only be undertaken in a spirit of care and respect for the “other” who also is created in the image of G-d. And when we, “…stand on the sure foundation of the love of G-d,” as my husband of blessed memory Dr. Dwight Pryor expressed, Jews and Christians working together constructively and kindly, are able to recognize the bugaboos and can help to move the dividing fences. Dr. Shapiro has risen to the challenge to navigate the Jewish-Christian border and, engaging in dialog as fairly and objectively as possible, she delves into the issue of Christian Zionism and its corollaries. She presents a masterful and refreshingly readable book that offers a clear view of the bigger picture. Both Jews and Christians need to be aware and informed as to the political and religious conflicts concerning Israel, as the implications and resulting effects, for both camps, are too serious to be apathetically avoided or ignored. Challenge your thinking and read the book!